To be honest, it looks bogus. 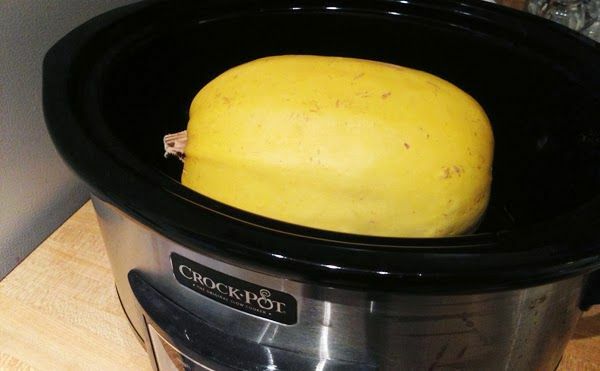 Just put the whole thing in the crockpot with some water for a couple of hours? That’s it? But I hate slicing a giant raw squash (It hurts my weak American arms) so I tried it. After 2 1/2 hours on high it sliced open quite easily and was all cooked inside. Amazing! All I had to do was take out the seeds and then use a fork to get the spaghetti squash scraped out for eating. I ran into one of the problems I’ve found more than once on pinterest. I call it Pretty Picture That Leads Nowhere. There’s no recipe. This food does not really exist. But I was determined. I searched diligently for the real recipe. I would not rest until I’d found it! It was tough… but I found the recipe!! 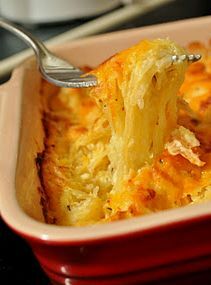 Toss the spaghetti squash strings into a baking dish. Cut up the butter and put it in while the squash is still hot so it will melt. Then mix in the sour cream and sprinkle the onion and pepper on it, mixing that in as well. Throw the cheese on top. Then feed it to your family with pride. Because there’s nothing like a healthy vegetable… smothered in butter and cheese. I went out to lunch with a friend recently. Unfortunately, the twins were out of school, so I had to drag them along. My friend was very gracious about this, and refrained from comment as Little Girl jumped all over the seat, exposed her underwear to a neighboring table, and wondered aloud why her gourmet macaroni and cheese did not resemble Kraft Easy Mac. But then the upholstery of my seat (ahem) made a noise. My friend tried to pretend she didn’t hear anything. I said calmly that I did not fart; my seat cushion made a noise. I demonstrated the noise by sliding around on the upholstery of the booth some more. I don’t think she’ll be wanting to go anywhere with me for a while. But let the record show: I did not fart. IT WAS THE SEAT!!!!! I’ve started amusing myself by responding to my fake commentators. Only the ones in English, of course. As for the twenty or thirty comments a day I am receiving written in Japanese and Italian– I’m just marking those as “spam” and trashing them. Them: Just break up? Can you get your girl back? Find out how! Me: Wow, thanks for the offer, but I’m good. I’ve got enough girls. Me: I would love to talk approximately with you in a hyperlink exchange contract; however, I fear you are not an actual person. Alas. Me: Your comment is very interesting. Not only does it have nothing to do with MY post, it doesn’t even relate to when the New York Giants are playing. Also I always thought Grape Nuts and Banana Nut Crunch were icky cereals, but who knew they were also bad for the environment? Wow. Posted on October 23, 2013 October 18, 2013 Categories RandomTags bugs, HawaiiLeave a comment on I’m not crazy. It just appears that way. 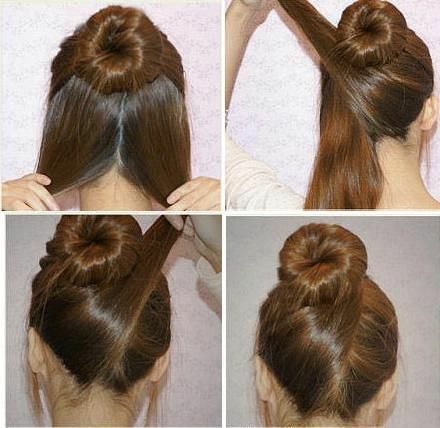 I’m test-driving some pinterest hair tips for the benefit of you, my reader. And also to try to make my hair look better. Okay, the next one was a little more trouble. I followed the directions, but my hair did not come out as nicely as Blondie’s there. For one thing, I had my daughter talking photos of the back of my head. “You can’t see the braid!” I complained when I looked at the photos. Which explains why models usually have nice blonde hair, or pretty highlighted hair. Anyways, it didn’t look right, and it felt weird. I took the braid out after about an hour because it was annoying. I think maybe this one was beyond my skill level. But anyways, one out of two isn’t bad!